The media has advised us that the real estate salesman candidate for president “won’t back down”. Not yesterday, today or for the foreseeable future. 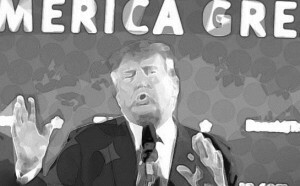 America’s casino condo king will continue to make bogus, bigoted and bizzaro statements – throwing red meat to the slack-jawed and sanctified, the bankrupt and bigoted – the foreclosed upon neo-fascisti. Even when news announcers take a firm tone, the real estate salesman candidate simply won’t back down. His legion of supporters remind that, speaking in generalities as he does and using dog-whistle coded language, the real estate salesman’s shtick doesn’t amount to open incitement or certified hate speech, you know, like that cowboy Cliven Bundy. The real estate salesman can really sell it. Got a limousine kind of slick to it – not really New Yorky, but more ‘Lifestyles of the Rich and Famous’ kind of intolerant, America first, expensive suit wearing fist pumping ‘know I’m right’ American aspirational neo-fascism. And his lawyer can even defend his ability to contradict known reality with no shame…I mean both the lawyer and the real estate salesman. The real estate salesman is a defiant truth teller. The real estate salesman is obstinate bigoted dumbass. Either way, the guy is a real estate salesman.